“Gaslamp Fantasy,” or historical fantasy set in a magical version of the nineteenth century, has long been popular with readers and writers alike. A number of wonderful fantasy novels, including Stardust by Neil Gaiman, Jonathan Strange and Mr Norrell by Susanna Clarke, and The Prestige by Christopher Priest, owe their inspiration to works by nineteenth-century writers ranging from Jane Austen, the Brontës, and George Meredith to Charles Dickens, Anthony Trollope, and William Morris. And, of course, the entire steampunk genre and subculture owes more than a little to literature inspired by this period. Queen Victoria’s Book of Spells is an anthology for everyone who loves these works of neo-Victorian fiction, and wishes to explore the wide variety of ways that modern fantasists are using nineteenth-century settings, characters, and themes. These approaches stretch from steampunk fiction to the Austen-and-Trollope inspired works that some critics call Fantasy of Manners, all of which fit under the larger umbrella of Gaslamp Fantasy. The result is eighteen stories by experts from the fantasy, horror, mainstream, and young adult fields, including both bestselling writers and exciting new talents such as Elizabeth Bear, James Blaylock, Jeffrey Ford, Ellen Kushner, Tanith Lee, Gregory Maguire, Delia Sherman, and Catherynne M. Valente, who present a bewitching vision of a nineteenth century invested (or cursed!) with magic. This entry was posted in Book of the week and tagged anthology, Book of the Week, EM Castellan, Gaslamp Fantasy, Gaslight Fantasy, Gregory Maguire, Leanna Renee Hieber, Queen Victoria's Book of Spells, short stories, Victorian Fantasy, YA Historical Fantasy. 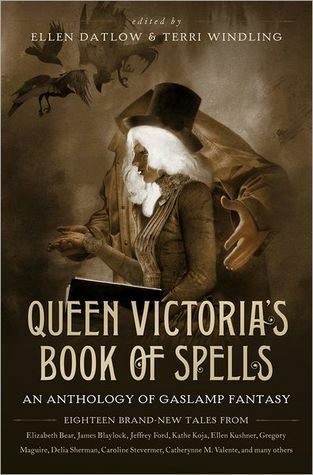 Queen Victoria’s Book Of Spells…everyone needs one of those, lol. Count me in!